Why are thousands of people worldwide choosing the Cerec restorative technique? Simple... Single Appointment Dental Care. Most dental restorative methods require more than one visit to the dentist. This means that on the first visit, you get an injection of anesthesia, your tooth prepared, an impression taken, and a temporary restoration put on your tooth. You make a second appointment for a couple of weeks later, get another injection, have the temporary removed (if it hasn't fallen off already), and have a permanent restoration put on. Why go to the dentist a second time when you don't have to? With Cerec, the procedure is done in a single appointment, start to finish. A Cerec tooth restoration isn't just convenient, it is also healthy. Many years ago, dentists had few options to repair decayed and damaged teeth other than amalgam, gold, and other metals. With Cerec, your dentist can use strong, tooth colored ceramic materials to restore your teeth to their natural strength, beauty, and function. These materials closely match the composition of natural tooth structure. This means when you eat hot food and then drink something cold, the restoration and tooth expand and contract at almost equal rates. So, your tooth does not crack, and you can go on enjoying your evening. Also, the materials are chemically bonded to your tooth, so your dentist can save as much healthy tooth tissue as possible while providing you with a dental restoration that strengthens your tooth. Your dentist can use Cerec for more than just crowns and fillings. Cerec is capable of producing any single tooth restoration. Chipped or discolored front teeth can be repaired with beautiful Cerec porcelain anterior crowns or veneers. Worldwide, a CEREC restoration is placed every 20 seconds. With a history of over 23 years, this equipment has helped dentists place millions of restorations worldwide. Using metal free materials that are the closest to your natural enamel, CEREC gives you the highest quality restorative care. The days of taking impressions for a crown, making temporaries, and waiting two weeks for your final product are virtually eliminated with the latest technology in Cerec Crowns. 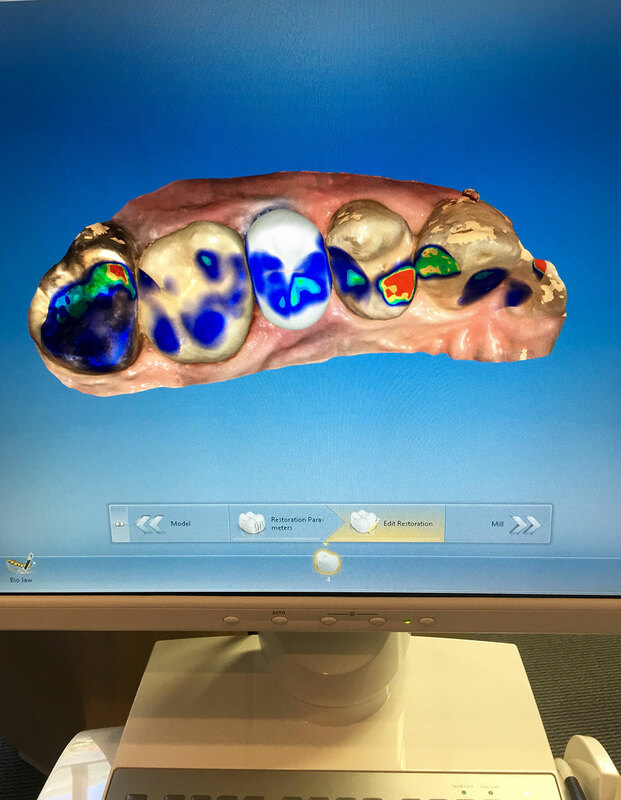 Using Cerec, an infrared camera takes images of your tooth, after it has been shaped, and a three-dimensional virtual model is created. Our assistants then use a computer program to design your crown or onlay. The data is sent by modem to our milling machine, and in minutes your restoration is ready to be polished, cemented into place, adjusted, and you are on your way! Our patients love the convenience of Cerec technology. It means in most cases that in one appointment your tooth can be restored. Less time in the dental chair and fewer appointments are needed. Less tooth structure is lost in most cases. Risk of complications and/or sensitivity is lowered because the tooth structure is more accurately measured. Many fabricated crowns have a metal substrate that porcelain is bonded to. Because Cerec crowns are milled from a solid block, there is less chance of allergic or immune response to the material in the crown. Dr. Baumann and our registered dental assistants have taken extended training in Cerec technology over the past four years, updating their skills with concurrent updates in equipment. We are happy to offer you the latest, and greatest, in dental technology.